Crossroads On The Charles. One-level living at Watertown's premier residence. Spacious and sunny 3 bedroom condominium with 2 exposures, 2 private balconies and 2-car garage parking. Spotless condition with brand new stainless steel appliances, new paint, new carpeting and new in-unit washer and dryer. 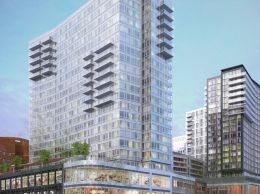 Incredible southeast exposure with many windows & sliding glass doors affording panoramic Boston and Charles River views. A full-service building with 24/7 concierge, on-site superintendent & superb professional management. Indoor heated pool with whirlpool. Many common patio spaces to hang out and relax, all sited on 2 acres of professionally-maintained grounds. The information in this listing was gathered from third party resources including the seller and public records. Listing information provided courtesy of Edward Kebadjian of Real Estate 109. MLS Property Information Network, Inc. and its subscribers disclaim any and all representations or warranties as to the accuracy of this information.